Bunshi Fugetsu shares some of his memories with Millie. 5Department of Mechanical Engineering, MIT, 77 Mass Avenue, MA, USA. 6Department of Physics and Department of Electrical Engineering and Computer Science, Massachusetts Institute of Technology, 77 Massachusetts Avenue, Cambridge, MA 02139-430, USA. This year is the sixth year after the radiation leak in Fukushima, Japan. On 11 March 2011, the day of the unforgettable disaster of the 9 magnitude Tohoku earthquake and quickly followed by the devastating Tsunami, a damageable amount of radionuclides had dispersed from Fukushima Daiichi's damaged nuclear reactors. Governments, local residents and scientists since then have had to face up to the clean-up task which can take as long as many decades or even centuries for full recovery. Decontamination of the dispersed radionuclides from seawater and soils, due to the huge amounts of coexisting ions with competitive functionalities, has been the topmost difficulty; the developing of desirable materials and/or processes for seawater and soil decontamination thereby remains big challenges. Ferric hexacyanoferrate, also known as Prussian blue (PB), is the first approved drug product for trapping radioactive cesium from the exposed patients; its high tendency to form colloids in water (this is true for both the soluble and insoluble types of PB) however, has restricted its applicability for open-field radioactive cesium decontaminations. A nano/nano combinatorial approach, as is described in this presentation, has provided an ultimate solution to the intrinsic colloid formation properties of PB. Cellulose nanofibers (CNF) prepared by using TEMPO-oxidization were used as the nano-sized anchors to immobilize PB via the creation of CNF-backboned PB. 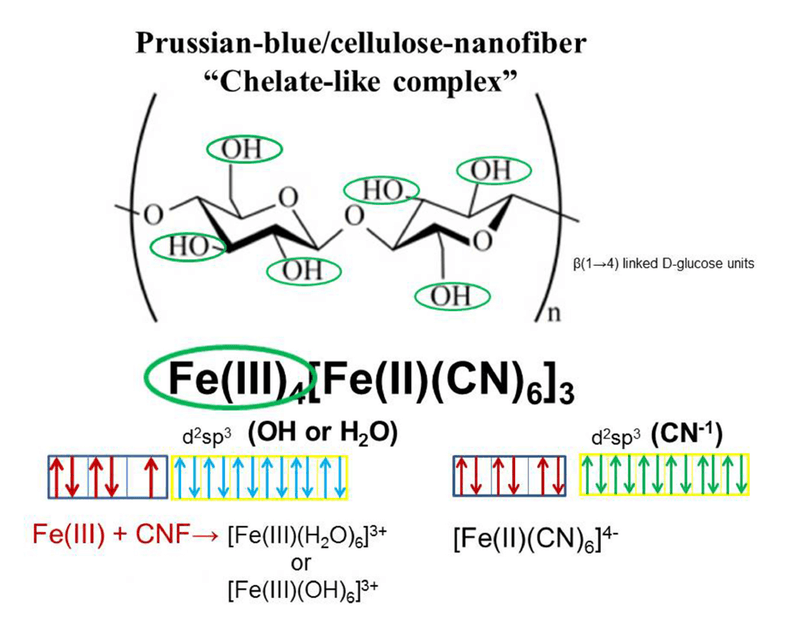 In a typical synthesizing experiment, Fe (III) ions were firstly immobilized onto CNF via chelating interactions; a certain amount of hexacyanoferrate was then introduced and PB nanoparticles having diameters < 10 nm with CNF as their backbones were obtained. The CNF-backboned PB (CNF/PB) nanoparticles were immersed in an aqueous solution containing a certain amount of copper(II) ions overnight to stabilize the ferrous ions of the CNF/PB nanoparticles. Note here that the ferrous ions of PB are unstable under conditions of ultraviolet light, high temperature, and low or high pH; this chemically unstable difficulty was overcome by stabilizing of PB with the copper (II) ions. The Cu(II) stabilized CNF/PB nanoparticles are found to be highly tolerant to water and moreover, it gave a 139 mg/g capability and a million order of the magnitude distribution coefficient (Kd) for absorbing of mechanism considerably for achieving the goal of the selective absorption of cesium ions by the Cu(II) stabilized CNF/PB nanoparticles. Field studies on soil and seawater decontaminations in Fukushima gave satisfied results, demonstrating the high capabilities of the Cu(II) stabilized CNF/PB nanoparticles for practical applications. It has been observed experimentally that cellulose nanofiber (CNF) was highly capable of binding Prussian blue (PB) nanoparticles. Chelation between PB and CNF is the key mechanism considerably for forming the PB/CNF complex. This new class of “nano-sized chelate-like” nanostructures can open up new possibilities for many practical applications in various fields with the nano-sized particles as the key functioning elements. In this study, the CNF/PB nano complex was used as the constitutive elements for creation of a three dimensional PB based porous nanostructures for the selective elimination of radioactive cesium ions. Acknowledgement: this study was supported in part by Grant-in-Aid “Development of high-performance-materials through cooperation with engineering technologies by using materials derived from agriculture, forestry and fishery products as the functioning element” program from the Ministry of Agriculture, Forestry and Fishery of Japan.